Second generation Prius have four water pumps, three electric and one mechanical. The mechanical pump is much like those on conventional four-cylinder engines: it is belt driven and bolted on with a handful of 10mm fasteners. Like regular cars, it also has the potential to leak. 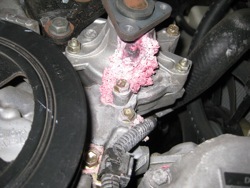 Initial signs are a pink crust under the weep hole; coolant residue eventually spreads around the shaft seal and down the front of the engine. We’ve never seen them bad enough to cause enough coolant loss to overheat the engine but there’s no question that the pump should be replaced. 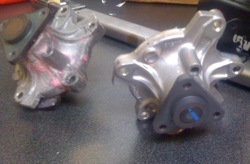 The good news is that the repair is straightforward and reasonably priced. Book time is just short of two hours, we charge an hour and a half.